Tanomura Chokunyū (1814–1907) was the student of Tanomura Chikuden (1777–1835), who was a master of Chinese poetry and painting. Chokunyū started his studies at the age of eight; Chikuden quickly recognized the young boy’s great talent for painting and soon thereafter decided to adopt him. Perhaps in response to Chikuden’s charity, in his later life Chokunyū became a philanthropist, supporting Buddhist temples and art students through donations of his work and via profits from sales. In 1880, he helped to establish Kyoto’s first art school, Kyoto Prefectural Painting School (Kyotofu Gagakkō). Known now as Kyoto City University of Arts (Kyoto Shiritsu Geijutsu Daigaku), the school survives today as one of the nation’s top centers of art education. In the upper left corner of the composition, the artist’s inscription describes the scene to the viewer. Sixteen arhats have exited a dark grotto in order to gaze upon the moon. Each exhibits his individualized reaction, showing their respect for the wonder and power of the natural world, and the mystery of the night moon. 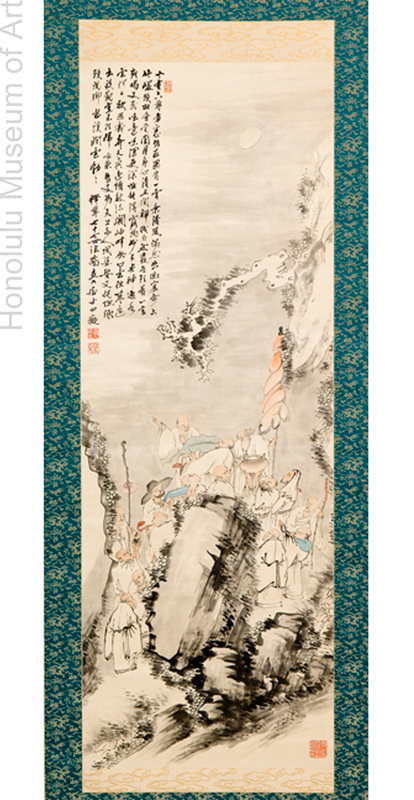 The serpentine composition begins in the bottom left corner as the last of the group leaves the grotto, following towards the upper right, following the line of arhats as it wraps around a large boulder, the latter rendered with bold brushwork. In contrast to the strong axe-cut strokes of the rocks, the figures are simply outlined with black ink and playfully accented with light colors. The viewer’s eye is drawn to a tall umbrella carried by one of the arhats. The umbrella points up towards the mysterious moon, which is partially obscured by a gray mist of light ink wash. Painted in the last ten years of his life, Chokunyū’s Sixteen Arhats represents his unique style, particularly his meticulous attention to detail and his sensitive use of color. Due to his lifelong support of art education, Chokunyū remains a highly respected figure in the history of Kyoto literati painting today. Paul Berry and Michiyo Morioka, Literati Modern: Bunjinga from Late Edo to Twentieth-Century Japan (Honolulu: Honolulu Academy of Arts, 2008), 304. Helmut Brinker, Zen in the Art of Painting (London: ARKANA Routledge & Kegan Paul Inc.), 63.